Super Hero Boy: Connor is getting a new big boy carseat! Connor is getting a new big boy carseat! The new baby is coming any day now and we're going from a one carseat family to a two car seat family, not to mention Connor has been growing like a weed lately so I figured now would be a great time to try out some new big boy options for our soon to be "big brother". Connor is really still too light for most booster seats but Evenflo's new Generations 65 Combination Booster may just be the last car seat we need to buy. The Generations 65 is an "extended use" combination car seat and booster seat. Rated for children 20-100 lbs this car seat can easily take a child from preschool to graduating their booster seat all together. If Connor takes after his parents at all I seriously doubt he will ever make it to the 100lb limit but with all the changes in car seat regulation that keeps happening this will undoubtedly keep him legal until he gets tall enough to go without a booster all together. In its beginning settings the Generations 65 looks much like any other toddler sized car seat with the exception of having more "big boy" looking arm rests. It has a five point harness, an adjustable head rest like many other car seats but lets talk about those arm rests again. I'm 9 months pregnant and my biggest complaint the last two months has been the fact that it's nearly impossible for me to get Connor in and out of a car seat especially if he has fallen asleep. I'm only 4'10 to begin with and combine that with a huge stomach just the prospect of climbing into a car after him is exhausting enough that I've rarely left the house in the last few months unless I had to, not to mention I've suffered with horrible back pain the last few weeks. Connor is pretty good about getting in and out of his car seat by himself but sometimes he needs mommy to help boost him up. Those arm rests totally make this car seat for me at the moment as they have a feature that made me downright giddy when I figured it out. The armrests actually lift up on both sides allowing the child to get into the seat without having to step over or be lifted over them. The first time you ever take a child out of this seat who is sound asleep you will sing their praises as well. The other thing we really loved about this seat is that the crotch belt is adjustable.. Connor is really quite small for his age and even on some of his smaller car seats one complaint that has come up here recently is that the crotch belts are starting to ride a little low on his legs and if your not careful you risk pinching him when you snap him into the five point harness. Though the Generations 65 is currently fine in its smallest position it is a big relief to know that once he grows we can let out that crotch belt to make him a bit more comfortable. You know honestly the thing we love most about this car seat is also the same thing that worries me about it later. I know I hear often from the older kids in my life that the only thing that they hate about having to still ride in a booster seat is the fact that they are in a full backed booster that "looks" like a car seat. Kids always seem to wanna grow up to fast and I guess its "uncool" to sit in a "baby seat". If your looking to save money which is always a HUGE priority in this family this car seat has to be one of the best options for children growing out of their toddler seats and moving more towards a booster as they can stay in this seat till they outgrow boosters all together. Do I honestly care if Connor is embarrassed later on about having to sit in a car seat? No.. his safety is far more important to me than his "coolness" factor. 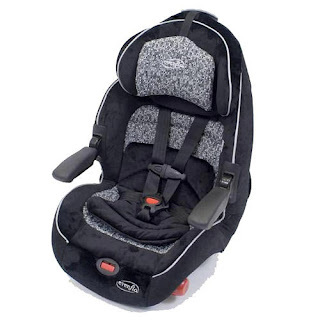 At under $100 for this booster it is absolutely a worth wild investment for families who are moving up into their first forward facing car seat or need a booster or car seat for a larger child as well. This car seat would also be a great option for larger toddlers who are just too tall or heavy for a most traditional car seats as well. You can learn more about this car seat on Evenflo's website as well as see a full video demo of all it's features. It is available for purchase on Amazon as well!